“In keeping with the finest traditions of Starfleet, these three crews accomplished this not through violence, not through some brute force of arms, but with compassion. This war has been brought to an end not by bloodshed but by an act of mercy. We also discover the ultimate origins of the Collective. As we learned in ST:IV (the one with the whales), the human propensity for unthinking violence can come back to bite us in the arse in a big way – in this case, the final Borg incursion into Federation space with not one cube but 7,000+ and with the goal of galaxywide genocide not assimilation. Mack has a field day showing up the impotence of the Federation and its allies in the face of Borg technology, destroying some of the most iconic planets of Trek mythology, including Deneva. A curmudgeon might object that the incursion’s resolution smacks too much of a deus ex machine, and they’d be right, but would you rather the Collective win? Besides, Mack is an excellent storyteller and you don’t mind the god-like intervention when it comes (in fact, you’ve been anticipating it). 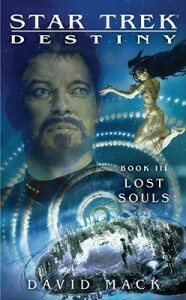 There’s nothing envelope-pushing or mind-blowingly unique about this trilogy but as I’ve said about the author before, if you’re not looking for anything too serious that stays true to the characters and ethos of Star Trek (and introduces some interesting new characters), then Mack is the author for you. Recommended to any Trekkie (or Trekker).